Summer means orphan season and a flurry of calls about abandoned hoglets. Hedgehog nests are not strong and sturdy, they are frequently just a pile of leaves, in long grass or underneath a large plant. Underneath sheds and decking are also favourite spots. I received a call after this nest was disturbed by someone raking leaves in their garden. If a nest is disturbed, mum may kill or abandon the hoglets. Sadly mum did not return for one of the two hoglets. The best way to prevent this happening is to avoid disturbing a nest in the first place. Learn to love your grass long. Cherish piles of leaves. Put off dismantling the shed. If you do accidentally disturb a nest, cover it back up straight away. DO NOT touch the hoglets with your bare hands. Wait and see if mum returns. She may return to the nest or may return and move the nest and babies to another site. If she does not return and the hoglets are ‘peeping’ or are venturing out of the nest, then they will be in need of rescue. You will find more information about how to find a hedgehog rescue here. Every year I rescue hoglets that have been abandoned or where something else has happened to mum – she could have been killed on a road or be injured or sick. Hand rearing hoglets is expert work and you should always seek expert advice from a hedgehog rescue. It is not something to take on without any experience. You can find some further basic advice here to help you until you can find a rescue. This little hoglet is around 11 days old. It can curl up but its eyes are not yet open. It will need hand feeding by syringe until it is able to eat by itself. They are fed a lactose-free formula (the only ones I recommend are Royal Canin Babydog and Esbilac for puppies) and will then be gradually weaned onto a puppy mousse when their teeth emerge. Orphaned hoglet about 11 days old. Her eyes are still closed. Once it can feed on its own, human contact will be reduced. 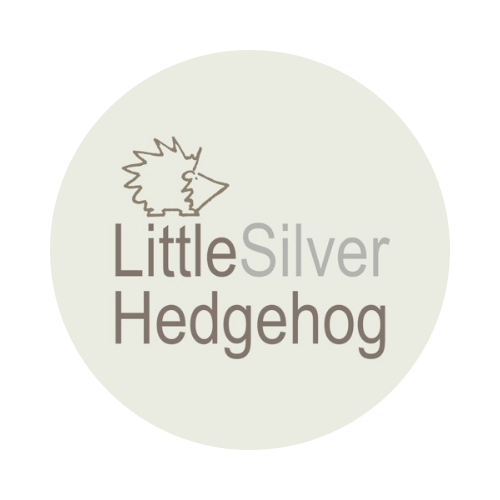 The aim is for the hoglets to be released back to the wild once they are a suitable age and weight for release. I run a hedgehog rescue in York, England. I have rehabilitated over 350 hedgehogs since 2012. I also work hard to raise awareness of the plight of hedgehogs and how you can help them. My work is entirely self funded. You can support find out more about me and my work here and also how to support it. I also make silver jewellery inspired by nature and wildlife and you can visit my jewellery shop here. Your work with hedgehogs is very important. Thank you for this information.